With very limited TV time to campaign, dodging questions about economy during interviews, and focusing his social media campaign on an anti-Workers’ Party sentiment, at first glance it can be hard to grasp Jair Bolsonaro’s actual propositions for Brazil. His closest advisers, however, can provide good clues to understand the far-right presidential candidate’s platform. In addition to family members, Bolsonaro’s inner circle includes an ultra neoliberal economic guru who advocates for highly controversial propositions like privatizing state-owned assets and companies, military hardliners, and members of the so-called BBB (Beef, Bullets, and Bible) caucus, which represents Brazil’s agribusiness sector, security forces, and evangelical churches in Congress. Whenever someone asks him about his economic platform, Bolsonaro parries and refers interviewers to Paulo Guedes, which ultimately became a running joke as the adviser who has all the answers. Guedes holds a degree from the University of Chicago, known for its orthodox, neoliberal economic thinking. He advocates for selling all state-owned companies, bringing back a loathed financial transactions tax called CPMF, and setting a 20-percent income tax rate, reducing taxes on the wealth and significantly increasing them on the poor. After announcing some of these measures and facing the consequent backlash, the candidate started to cancel his participation in public events. Juliane Furno, a doctoral researcher in Economic Development at the University of Campinas, says Guedes’ propositions for the economy are extreme to an unprecedented degree in Brazil’s political conversation. “Paulo Guedes once said he thought the issue with the FHC [Fernando Henrique Cardoso] administration was that it was too ‘social democrat,’ and called for pure economic liberalism. He is a legitimate representative of the Chicago school of economics. He has neoliberal propositions that we have never seen the Right in Brazil push so fiercely before. It’s a different platform from the [Michel] Temer administration. It is similar, but much more extreme. He speaks about collecting R$2 trillion [~US$500 billion] in four years’ term by selling absolutely all state-owned companies. Macroeconomic balance is more important [for him] than anything else, there is no proposition to create jobs. The State would no longer undertake initiatives,” said Furno, who is also a Brasil de Fato columnist. Former military general Hamilton Mourão, Bolsonaro’s vice presidential running mate, is infamously known for his controversial statements. During the Dilma Rousseff administration, he stood for a military intervention to oust her. In a recent event in southern Brazil, the former general made racist remarks, saying Brazilians have inherited the “idleness” of indigenous people and the “rascal ways” of enslaved black people. Mourão has also decried the 13th salary Brazilians who have formal jobs are required to receive. Bolsonaro’s campaign management actually disavowed the military running mate, but that didn’t stop him from reiterating his opinions. He argues he is the “propagandist” in the campaign, while Bolsonaro is the “firebrand” – which means he would be in charge of drawing up their political guidelines while Bolsonaro would be nothing but their front man. Before settling for Mourão, the campaign considered Augusto Heleno, a commander of troops in Haiti, to be Bolsonaro’s running mate, but his conservative Progressive Republican Party (PRP) did not formally joined the campaign. Heleno is seen as the middleman between Bolsonaro and high-ranking military officers. Also orbiting Bolsonaro is a group of members of Congress associated with the Bullets caucus – who oppose gun control policies and used to be funded, until 2014, by the arms and ammunition industry –, the Bible caucus – composed of neo-Pentecostal politicians whose views oppose State secularism –, and the Beef caucus, which lobbies for agribusiness. Some of these politicians stand out: federal congressman Major Olímpio, Fernando Francischini, and Onyx Lorenzoni, as well as senator Magno Malta. Lorenzoni and Malta play a key role lobbying with centrist parties for the runoff vote. 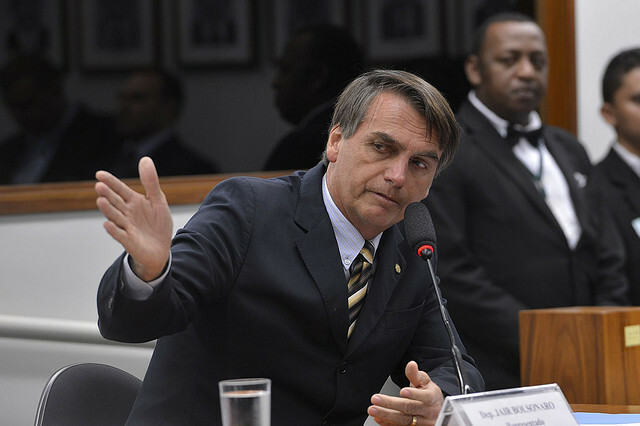 This week, the agribusiness caucus endorsed Bolsonaro, as well as the leader of the Universal Church and media mogul, Edir Macedo. Bolsonaro has three children in politics: Eduardo is a federal congressman; Flávio is a member of Rio de Janeiro state legislature; and Carlos, a Rio de Janeiro councilman. They operate on social media responding to attacks against their father and also fight over how to conduct Bolsonaro’s campaign with traditional leaders of their Social Liberal Party (PSL). They have also been taking a key role on social media and public speeches making sexist, homophobic attacks and in support of the dictatorship and torture. Gustavo Bebianno, a lawyer and adviser for Bolsonaro’s campaign, became the interim president of the PSL – the ninth party Bolsonaro has joined in his 27 years as a politician. Claiming he “does not know about politics,” Bebianno says his role is to protect Bolsonaro from controversies within the party. “I don’t see anything new about this combination of a conservative ideology in terms of morals, customs, sexuality, gender, etc. and a traditional Right, strictly speaking. There are several indicators of how Latin American right-wing thinking combined conservative religious thinking with militarism,” he says. Quinalha says Bolsonaro’s speech follows a similar pattern to Brazil’s recent historical experience during the military dictatorship. “The dictatorships in the Southern Cone since the 1950s and 1960s somehow show that. It’s a mindset that part of society had. During the dictatorship in Brazil, there were very specific sexual policies to impose a standard of family and citizen to serve this conservative moral. Evidently, there are differences and specific characteristics to each historical moment, but they also share very strong similarities. He is very socially conservative and very politically authoritarian, while economically he oscillates between authoritarian State interventionism and more neoliberal views, which is not compatible with this thinking,” Quinalha argues. The association between authoritarian thinking and economic liberalism Quinalha mentions is not new in Latin America, as they have been the ingredients of the Augusto Pinochet regime in Chile – which actually had intellectuals associated with the Chicago school of economics actively participating in it. “Looking back at our dictatorship [in Brazil], it was authoritarian from a political point of view and extremely statizing. It created 113 state-owned companies. It was very different from the dictatorship in Chile, which was free-market oriented,” Juliane Furno argues. The researcher explains Bolsonaro’s platform brings these two sides together: a more authoritarian government with an extremely neoliberal economic policy. Quinalha says that would be one of the factors that may explain why Bolsonaro can so naturally stand for a platform that is based on reminiscing the dictatorship and making constant tributes to Brazil’s most infamous torturer, colonel Alberto Brilhante Ustra. And that may also help explain the views of the PSL presidential candidate.